My Stupid Meal came with a toy. It's a pair of 3-D goggles. When I wear them, I can see what apparently every other warlord and caster can see naturally... unit stats. Everything that fights is a "unit." Units have four sets of stats: move, hit, attack and defense. They may also have natural abilities. Some of these include flight, fire, regeneration, poison, and probably a couple million more. I don't know yet. Leadership also counts as one. Any unit with leadership ability is called a "Commander" or "Warlord." These units give a bonus to units under their command. 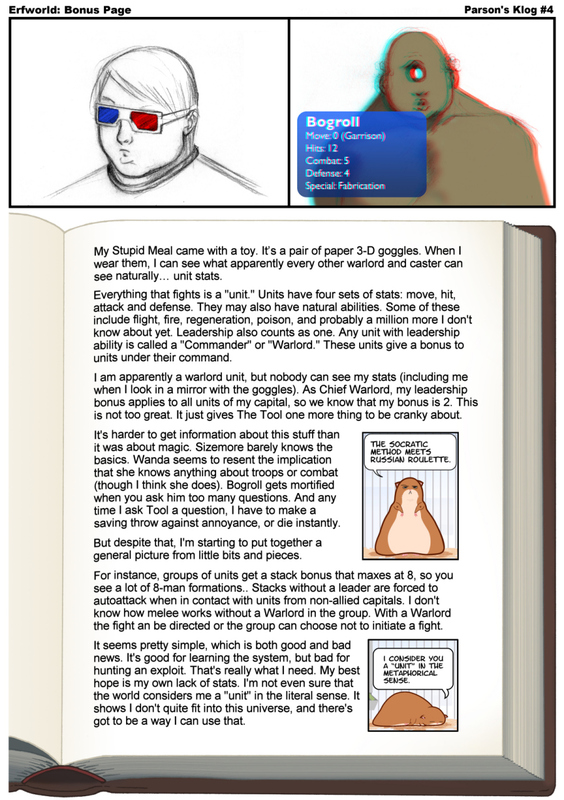 I am apparently a warlord unit, but nobody can see my stats (including me when I look in a mirror with the goggles). As Chief Warlord, my leadership bonus applies to all units of my capital, so we know that my bonus is 2. This is not too great. It just gives The Tool one more thing to be cranky about. It's harder to get information about this stuff than it was about magic. Sizemore barely knows the basics. Wanda seems to resent the implication that she knows anything about troops or combat (though I think she does). Bogroll gets mortified when you ask him too many questions. And any time I ask Tool a question I have to make a saving throw against annoyance, or die instantly. Hamstard: The socratic method meets Russian Roulette. But despite that, I'm starting to put together a general picture from little bits and pieces. For instance, groups of units get a stack bonus that maxes at 8, so you see a lot of 8-man formations. Stacks without a leader are forced to autoattack when in contact with units from non-allied capitals. I don't know how melee works without a Warlord in the group. With a Warlord the fight can be directed, or the group can choose not to initiate a fight. It seems pretty simple, which is both good and bad news. It's good for learning the system, but bad for hunting an exploit. That's really what I need. My best hope is my own lack of stats. I'm not even sure that the world considers me a "unit" in the literal sense. It shows I don't quite fit into this universe, and there's got to be a way I can use that. ^ "Regeneration" was later replaced by "Fabrication". ^ A "saving throw" is a gaming mechanic to represent a character's chances of avoiding the effects of an attack or other event. For example, see the saving-throw rules from the DnD SRD. ^ The Socratic Method is a form of discussion by raising questions in order to examine ideas. ^ Russian Roulette is a lethal gamble in which the player places one bullet in a revolver, spins the chamber, and fires the revolver at his own head. This page was last edited on 12 October 2009, at 22:29.